(Denver) We often encounter artwork that makes us stop and wonder — what does this mean? What was the artist thinking, what were they feeling? With some art it’s obvious what the motivations were, but with others, the viewer is only left to guess. 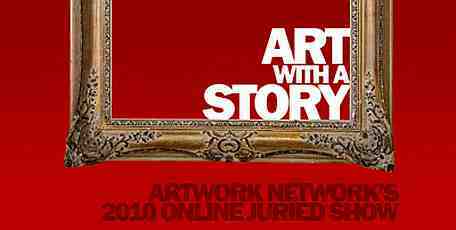 With Artwork Network’s 2010 Online Juried Show, “Art with a Story”, we want artists to let us in on the secret. Whether in writing or verbally via a short video, artists can give the public some insight into the layers of the visual mystery they’ve created. We don’t care what it’s about: personal insight, the neighbor’s dog, the future of the world; all stories and all artistic mediums will be accepted. The show will be presented solely online, and voted on by both a selected jury and the public. Each piece will be judged by the digital representation provided. Submissions are now being accepted at www.artworknetwork.com/juriedshow. Selected Jury members include Sandra Renteria (artist and humanitarian), Allen McLain (Senior Executive Producer at Sky Theory Video Production), and Jessica Bradley (Creative Director at Artwork Network). Additional Jury members to be determined. Two sets of prizes will be awarded, based on jury vote and public vote, in the following categories: Best Artwork, Best Story, Best Story/Artwork Combined. Prizes include a free one year Basic Level membership with Artwork Network, gift certificates, and cash! All winners will have their winning pieces showcased in the Artwork Network Showroom during the month of January 2011, and will be viewed by thousands of visitors during the popular First Friday Artwalk. Complete details (including information about voting, prizes, and entry fees) can be found on our website at http://www.artworknetwork.com/juriedshow. Artwork Network connects buyers and sellers via the web, and provides technology-driven art consulting to help collectors, businesses, and interior designers find the perfect original art. An extensive array of inventory from over a hundred talented artists can be viewed online at www.artworknetwork.com. Additional services include business art rotation, online art brokerage, art consulting, handling and installation, artist and gallery websites, as well as in-house framing and photographic services. The showroom and working artist studios, (located in the heart of Denver’s exciting ArtDistrict on Santa Fe) displays a selection of our member’s work for view and purchase.